Looking for a monster to kill for Rune Chain Bodies, quick Herblore experience, or maybe just a dropper of level 3 Clue Scrolls? Goraks are the monsters to kill! Warning: Protect Prayers such as Protect from Melee do not work on Goraks. For killing Goraks, I recommend using either Melee or Ranging for killing Goraks, as Mages will not have the defensive bonuses to survive against these creatures. 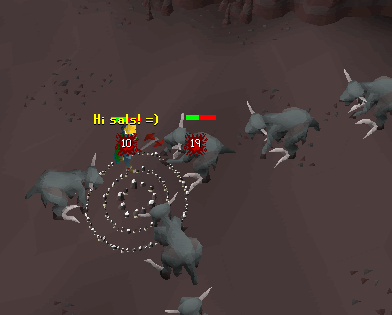 Melee: At least Rune, if not Dragon or Barrows, as Goraks can hit hard and fast! Rangers: The best Dragonhide you can wear. Weapon: A Dragon weapon, Whip, or Barrows. Ring: Since Goraks can drop Rune chain bodies, I suggest a Ring of Wealth, but a Ring of Recoil works fine too. Armor: Full Rune or better is a must! Boots: Armored boots, such as Rune, or Fighting and Fancy Boots work. Cape, Shield, and Gloves: Use the best of each you can, as any bonus is important against such a powerful enemy! Weapon: Magic Bow or Crystal Bow if possible. Armor: The best Dragonhide possible, and a Fremennik Helm if you can. Boots: If you can afford Rangers Boots, use them, if not, use Climbing or nothing. 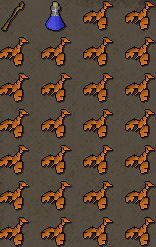 Gloves: Dragonhide Vambraces. Or the gloves from Recipe for Disaster. Cape and Ring: Same as melee equipment. You have armor that will protect you against the Goraks' high hits. You can stay near the center of the area, and have easy access to the only way out: the ring. The Goraks will continually swarm you, so food will go fast. If you can trap the Goraks, they can do little to hurt you. Goraks have a very low Ranging Defence, so your attack will do more. It is very difficult to trap the monsters, and since they swarm around you, you may be attacked by one and unable to trap it. Your dragonhide will not provide very high bonuses, allowing the Goraks more frequent hits. Goraks can easily hit up to 140 damage in a single hit, so for killing them, Food is a must. Food: At least lobsters, if not swordfish or sharks if you plan on a long visit. If you have Full Guthan's at your disposal, you can you use that to conserve food, allowing you to carry more drops. Potions: If you want, bring stat potions to aid in killing them. Dramen Staff: This is an absolute must, as it is impossible to get here without one! If you are a Ranger, you may want to leave a space open, as Goraks sometimes drop Mithril Super poisoned arrows! You must first travel to Zanaris, wield your Dramen staff, and open the shed door. Once you open the door to the shed with your Dramen Staff equipped, you will find yourself in Zanaris. Walk Southwest until you reach the fairy ring. Note, you must have your Dramen staff equipped and have permission from the Fairy Godfather to use the Rings. Don't worry! As long as you stay inside the ring, the Goraks cannot attack you, but as soon as you step out or attack one, even if you step back in, the Goraks will attack you! Also, any type of attack, Magic, Ranged, or Melee, forces your character out of the ring, causing you to forfeit the protection of the ring until you leave. 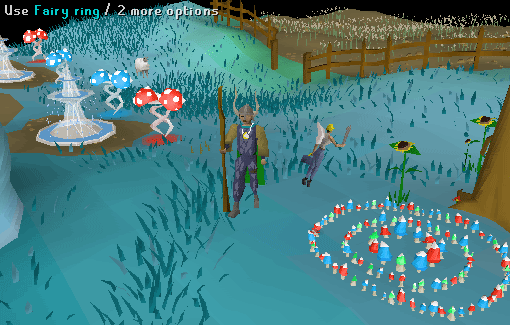 Stay near the Fairy Ring, so that once you run out of food, you can escape quickly. If there are too many Goraks around, hide in the cloud bank until they disperse. Try to trap one around or on the corners. Note: Once inside the cloud, click enter cloud at a corner to exit. However, you can enter the cloud from any point. 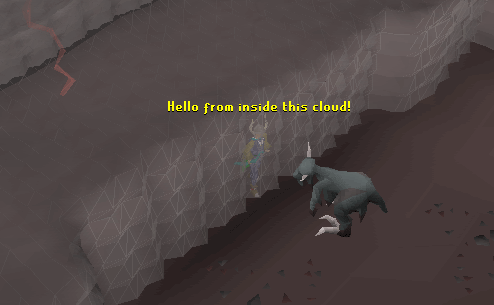 Also, Goraks cannot attack you while you are inside the cloud, but you cannot attack them. 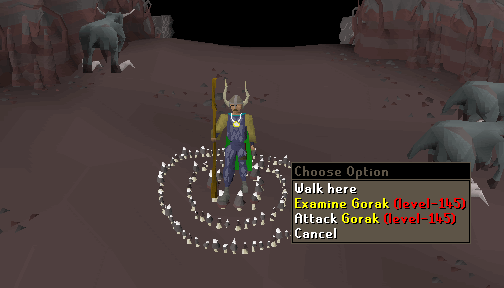 Gorak Claws are a common drop by Goraks. They can be used to make Magic Essence Potions, which give a temporary +3 boost to Magic. Level 57 Herblore is required to make this potion, and it yields 130 Herblore experience when created. 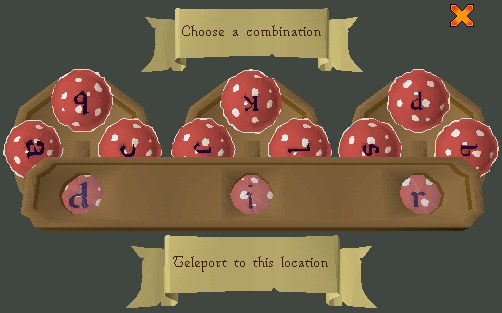 For more information, please visit the Herblore skill guide.